MUNICH — Bavarian State Opera will defy the heirs of Francis Poulenc and proceed with revival performances of its literally explosive staging of Dialogues des Carmélites later this month, the company said today. 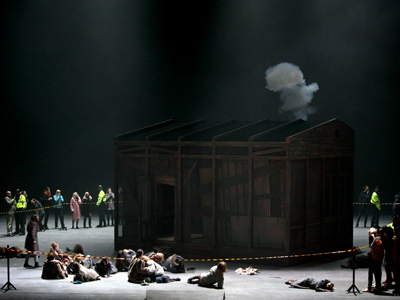 The 2010 production by Dmitri Tcherniakov departs from the scheme of the composer and the source novelist, Georges Bernanos, in several ways and has been described by the heirs as a “trahison.” Not the least of its transgressions is a substitution in the climactic scene: a deadly gas blast and one self-sacrifice (by Blanche) replace the serial guillotining of the titular nuns laid out graphically in the music. But a slow-won French court victory for the heirs last October constrained only BelAir Classiques and Mezzo TV from, respectively, selling DVDs of the production and screening it. The estates of both Poulenc and Bernanos had begun legal proceedings in October 2012, perhaps not aware of the nature of Tcherniakov’s efforts until BelAir’s DVD release that year. The last onstage revival came, by coincidence, the same month. Poulenc’s 1956 opera is evidently less tightly controlled, or protected, by his heirs than is, for example, Gershwin’s 21-years-older Porgy and Bess by the American composer’s estate. The company also noted it had made no alteration to libretto or score. This despite the stripping out of all Christian reference as well as the guillotining from the stage action. BStO Intendant Nikolaus Bachler is a firm, one might say notorious, defender of unfettered Regietheater. Not only will the show go on, but Bavarian State Opera is supporting BelAir Classiques and Mezzo TV in their appeal of the October court decision, the company said. Scheduled to sing the opera Jan. 23 to Feb. 1 are Christiane Karg as Blanche, Anna Christy as Constance, Anne Schwanewilms as Lidoine and Stanislas de Barbeyrac as the Chevalier. Susanne Resmark and Sylvie Brunet reprise their roles as Marie and de Croissy on the banned 2010 DVD. Bertrand de Billy conducts. This entry was posted on Thursday, January 7th, 2016 at 5:44 pm	and is filed under Munich Times. You can follow any responses to this entry through the RSS 2.0 feed. Both comments and pings are currently closed.